The theme of these products is portion control. I'm a total geek for cool new gadgets, so these really stood out to me. For a lot of people, it isn't neccessarily the foods we are eating that prevents weight loss, it is the amount of food we eat. America is stuck on "super-sizing" everything! We need to re-learn the appropriate amount of foods we should be consuming and these products can help us acheive just that! * The SmartSpace Dispenser by Zevro. Talk about a nifty way to measure your cereal or oatmeal in the morning. And why stop there? 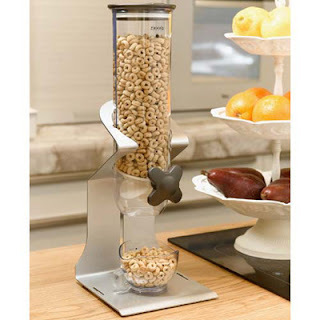 You could use this for snacks, granola and even different grains:)One twist of the handle dispenses exactly one ounce. Love it! Wishing you good health always! !